Project Project: Halloween at our house. 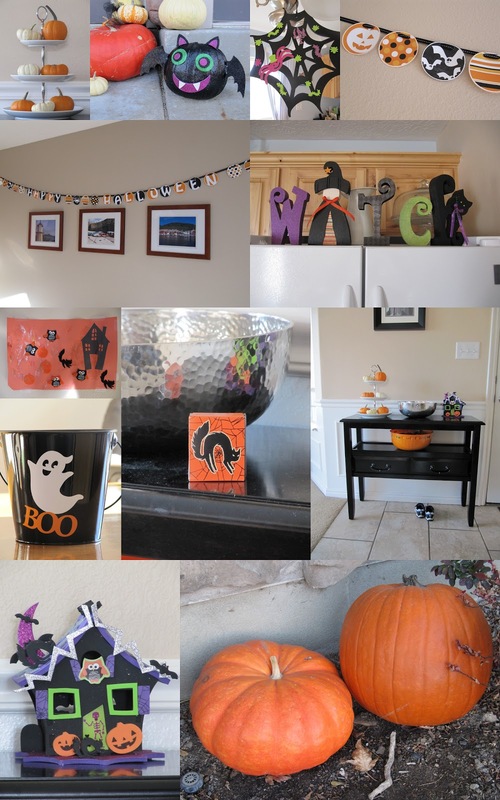 Halloween is only two days away, and we are feeling pretty festive around here, I must say! I've always thought Halloween was fun, but now that Espen is old enough to understand it better and get into the "spirit" of things, this year I'm enjoying Halloween more than ever. He's been excitedly talking about his dragon costume for weeks and weeks, and loves pumpkins and all the "creaky" (creepy) decorations we've been putting up lately. I've always loved a good celebration, so it's been extra fun to have an enthusiastic sidekick to get excited along with me. My two year-old son can say garland! As you can see (I hope! ), we're more into cute Halloween than we are into anything too scary-looking. There's also a solid dose of homemade thrown in, because Espen happens to love "making art", so we try to come up with a project or so every week. You wouldn't see much of it on Pinterest, but it's a good way for us to spend time together doing something we both enjoy. Earlier this month we spent almost two hours painting with water colors, and any parent of a two year-old will tell you how golden that is. In case you were wondering, the little haunted house, the spider web, the ghost bucket and the kit for the bat pumpkin all came from Target, and I wish they would sponsor me for how much Halloween stuff we've bought from them this year. I found the Halloween garland on Pinterest, and if anyone is interested, I'll do a quick Project Pinterest post about how I put it together. The Witch sign is something I made with friends last year (so crafty! ), and don't easily have a resource for. Points to Halloween, though, for coming with a ready-made color scheme! I didn't really notice that everything we have is orange, black, purple and green until I put this collage together, and now I feel totally accomplished. Now we have one more pumpkin to decorate, and a ghost lantern to hang, and then I think we're ready. And if I can manage to not eat all five lbs. of it by Wednesday, we are set with our Halloween candy too. I'll be back on Wednesday with some photos of our little dragon after we have pillaged the neighborhood for Halloween candy. Your decorations look wonderful! I haven't put up a single thing this year. :-( It's nice to see other people getting into the spirit of things!